Remember that scene in Vanilla Sky? 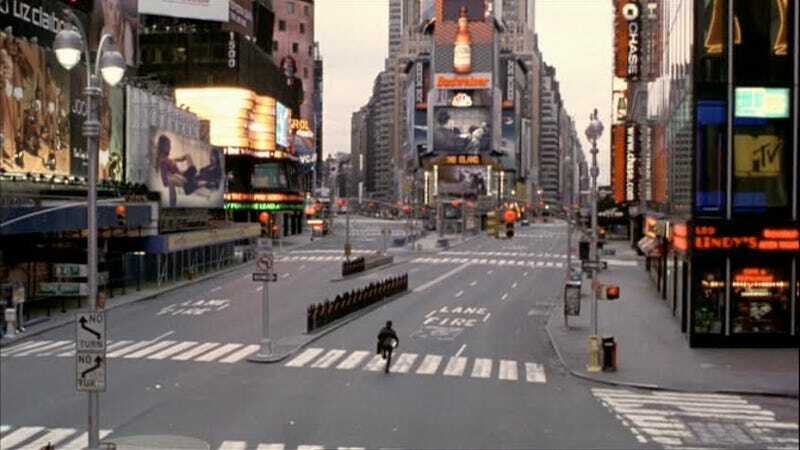 Tom Cruise runs into Times Square. And it's empty. You can't close off Times Square yourself, but through clever photography and patience, you could duplicate the effect. Capture a photo of a very busy space without people. There can be cars, animals, whatever...just no people. Imagine a plague hit. Or the aliens came and harvested us. Whatever, just no people. In video, this would be nearly impossible. But a still photo? It's not that hard! Edit: A few commenters have pointed out using a long exposure and an ND filter to get rid of people. You're welcome to use any technique you'd like. But blurring trails of people and cars won't create quite the effect we're going for: An eerie world without human life. Our lead shot is from Vanilla Sky. That's the bar. Send your best photo by Monday, July 2nd at at 10AM Eastern to contests@gizmodo.com with "Empty" in the subject line. Save your files as JPGs, and use a FirstnameLastnameEmpty.jpg (970px wide) and FirstnameLastnameEmptyWallpaper.jpg (2560px wide) naming conventions. Include your shooting summary (camera, lens, ISO, etc) in the body of the email along with a story of the shot in a few sentences. And don't skip this story part because it's often the most enjoyable part for us all beyond the shot itself!